The Southern Gentlemen Chorus is always looking for men of all ages who like to sing in the Barbershop Tradition. If you have any questions you can contact us or attend one of our practices and see first hand what we are all about. The Southern Gentlemen Chorus meets weekly at Cornerstone Assembly of God Church, 2304 US Hwy 70 East, New Bern, North Carolina (on the James City side of the Trent River bridge). Rehearsals are every Tuesday from 7:00 pm to 9:30 pm in the large building at the back of church lot. Men who have an interest in male acappella singing are encouraged to check us out. Hope to see you there! Click the Find tab on the menu bar for detailed directions to the rehearsal site at the Cornerstone Assembly of God Church. 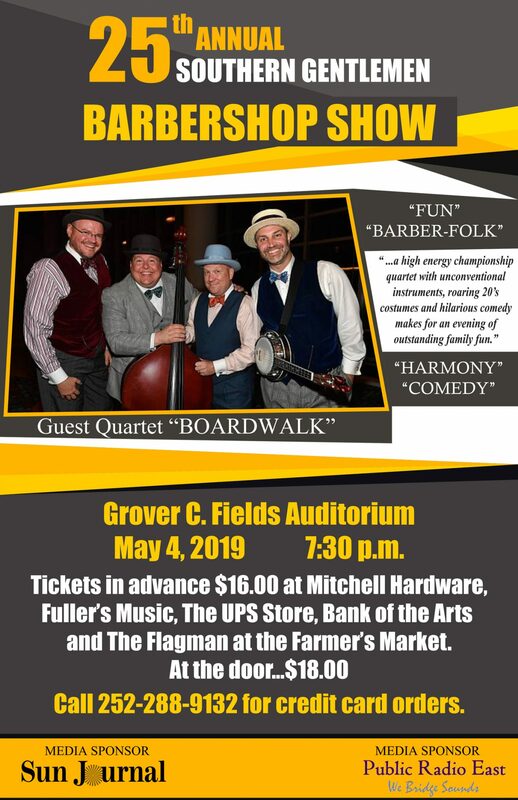 The 25th Annual Barbershop Show is coming up May 4th at 7:30 in the Grover C. Fields Auditorium. This year's Show will highlight the zany but wonderfully talented championship quartet, Boardwalk, from Atlanta, GA. Their roaring '20's costumes , their eclectic stringed instruments combined with their off the wall comedy pale when you hear their wonderful 4-part harmony. The Chorus appreciates your support which goes a long way in enabling the Chorus to help support such charities as Merci Clinic, the Coastal Women's Shelter and the opioid recovery program of Hope Clinic in Bayboro.